During a television interview on Wednesday, Donald Trump made some of his most detailed allegations about the fraud he says was responsible for Hillary Clinton's popular vote victory in the recently concluded presidential election. He said some Americans are registered and cast ballots in multiple states and that dead people and undocumented migrants are voting in droves. He added, confidently, that none of these illegal votes were for him. "They would all be for the other side," he said, possibly forgetting that one of the few arrests for voting fraud in 2016 was of an Iowa woman who tried to vote for him twice. When pressed for evidence to support his claims, Mr Trump cited a 2012 Pew study. When ABC's David Muir noted that the author of that report had said he found no evidence of fraud, Mr Trump got personal. "He's grovelling again," he said of the report's author, David Becker. "You know, I always talk about the reporters that grovel when they want to write something that you want to hear but not necessarily millions of people want to hear or have to hear." In fact, while the Pew report did find that many voting rolls contained outdated or inaccurate information, Becker said at the time and has since repeated that there was no evidence that these problems - often caused by voters moving or individuals dying without election registrars receiving updates - constituted evidence of fraud. Mr Trump's comments have been accompanied by a raft of tweets over the course of the week. In one instance, he cited a conservative activist from Alabama, Gregg Phillips, who created a smart phone app that crowd-sources claims of voter fraud. (It is currently unavailable on the Apple app store and has fewer than 5,000 downloads on Google Play). "Look forward to seeing final results of VoteStand," Mr M . "Gregg Phillips and crew say at least 3,000,000 votes were illegal. We must do better!" Although Phillips has made these assertions since election day, he has yet to provide information on how he arrived at this number. Scientific studies conducted over the past decade have found scant evidence of any voter fraud. Both Mr Trump and Vice-President Mike Pence have promised that the administration will conduct a "major investigation" into voter fraud. A formal executive action ordering such a inquiry could be issued in the coming days. "Depending on the results, we will strengthen up voting procedures," Mr Trump tweeted. Reality Check: Did millions vote illegally in the US? That last line is likely painfully familiar to liberals. Although Mr Trump's comments were over the top and easily debunked, they mirror more nuanced justifications Republican politicians have offered at the state level to justify tightening voter registration procedures, imposing strict polling place identification rules and curtailing early voting opportunities. They are part and parcel, critics say, of a comprehensive plan to limit turnout of Democratic-leaning voting groups that are less likely to have necessary identification, less able to take time off to vote on election day and less comfortable navigating through voter registration procedures. "Donald Trump is lying to the American people about undocumented people voting because he wants to set the stage for more voter suppression," Congressman Keith Ellison, a candidate for chair of the Democratic National Committee, told Washington's The Hill newspaper. "Expect Trump and his henchmen to push restrictive photo ID, limit early voting and make it harder to register." A national version of the state-level laws in places like Ohio, Wisconsin and North Carolina - which Democrats attribute to causing lower turnout levels for Mrs Clinton in those key swing states - would be a worst-case scenario for liberals. But it's just part of the current battle over voting procedures. The courts have been the site of some of the fiercest fights over voting rights in the past decade. 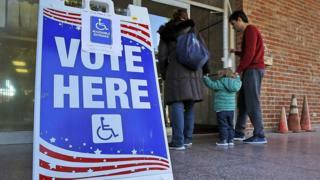 There are multiple ongoing cases dealing with voter identification measures being considered by lower-level courts, including a challenge to a Texas law that had been supported by the Obama administration but could now be opposed by Trump lawyers. Perhaps the most significant change in US voting law came from the Supreme Court in 2013, when it struck down a section of the Voting Rights Act that required the federal government to pre-authorise any changes in balloting procedures in certain states and jurisdictions, many in the South, that had a history of voting discrimination. That decision made it significantly easier for previously covered areas to implement the aforementioned voting restrictions - identification laws and early voting curtailment, in addition to the closing or relocation of polling stations. Conservatives have responded that such measures are necessary to ensure voting security - and, in any event, things like early voting are a recent development that have no constitutional protections. They argue that photo identification, required to board a plane or cash a cheque, are an everyday fact of life that present no significant burden to voters. Make no mistake, however, this fight over voter fraud is - at its heart - a nakedly partisan battle. As Republican legislators North Carolina made clear when they studied voting demographics and photo ID possession while crafting their state's election laws, it's a way to cut into their opposition's base. "Look, if African Americans voted overwhelmingly Republican, they would have kept early voting right where it was," long-time North Carolina Republican strategist Carter Wrenn told the Washington Post. "It wasn't about discriminating against African Americans. They just ended up in the middle of it because they vote Democrat." Democrats, one the other hand, tend to exaggerate the impact of identification laws and dismiss studies that show little effect on turnout. "Despite Republican legislators' best attempts to suppress minority voters, study after study has found that voter ID laws have little to no effect on voter turnout," writes Vox's German Lopez. "At worst, the effect is small - barely detectable even in studies that employ multiple controls. At best, there's no effect at all or even an increase." Other voting changes, like polling place consolidation and early voting curtailment, could have a more pronounced impact, however - and while it's unlikely any move in that regard would come at the national level, Mr Trump's rhetoric could provide cover for further state efforts. Add that to the already released plans to put the squeeze on cities - primarily in liberal states - that offer "sanctuary" to undocumented workers, and it seems increasingly like the Trump administration has political payback on its mind.